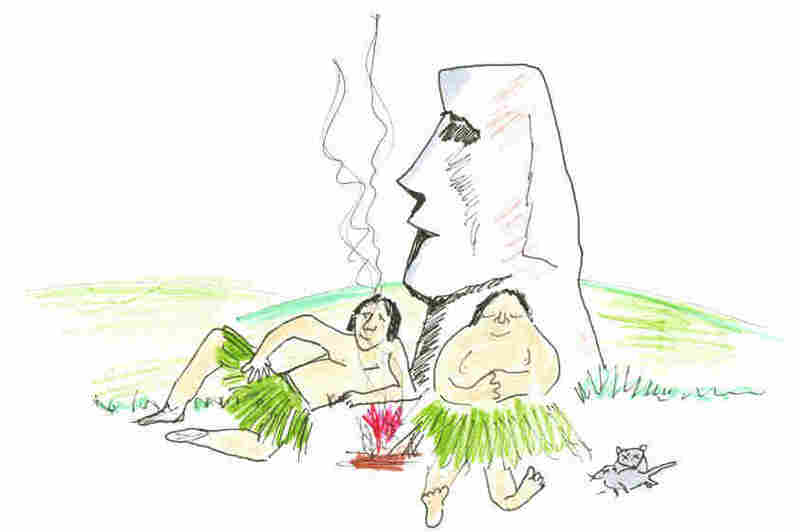 What Happened On Easter Island — A New (Even Scarier) Scenario : Krulwich Wonders... Whatever happened on Easter Island, it wasn't good. Polynesians landed there, farmed, thrived, built their famous statues, and then things went very bad, very fast. Sixteen million trees vanished. What happened? Was this a case of ecological collapse? Not exactly, say two anthropologists. It was, arguably, worse than that. Let me tell it the old way, then the new way. See which worries you most. First version: Easter Island is a small 63-square-mile patch of land — more than a thousand miles from the next inhabited spot in the Pacific Ocean. In A.D. 1200 (or thereabouts), a small group of Polynesians — it might have been a single family — made their way there, settled in and began to farm. When they arrived, the place was covered with trees — as many as 16 million of them, some towering 100 feet high. These settlers were farmers, practicing slash-and-burn agriculture, so they burned down woods, opened spaces, and began to multiply. 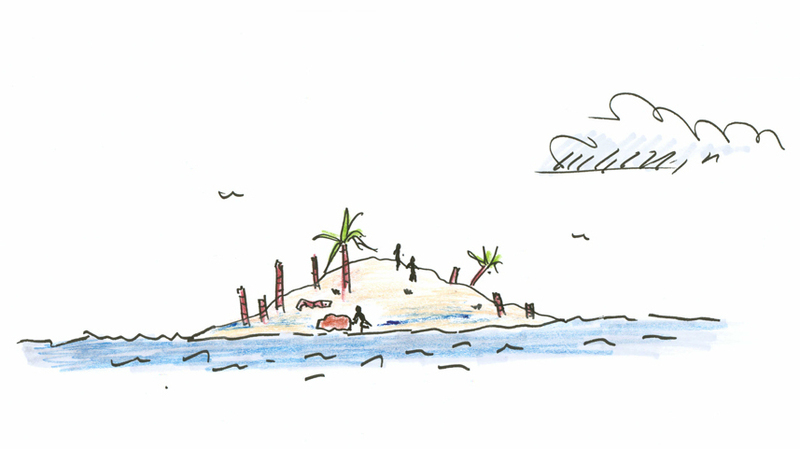 Pretty soon the island had too many people, too few trees, and then, in only a few generations, no trees at all. As Jared Diamond tells it in his best-selling book, Collapse, Easter Island is the "clearest example of a society that destroyed itself by overexploiting its own resources." Once tree clearing started, it didn't stop until the whole forest was gone. Diamond called this self-destructive behavior "ecocide" and warned that Easter Island's fate could one day be our own. When Captain James Cook visited there in 1774, his crew counted roughly 700 islanders (from an earlier population of thousands), living marginal lives, their canoes reduced to patched fragments of driftwood. And that has become the lesson of Easter Island — that we don't dare abuse the plants and animals around us, because if we do, we will, all of us, go down together. And yet, puzzlingly, these same people had managed to carve enormous statues — almost a thousand of them, with giant, hollow-eyed, gaunt faces, some weighing 75 tons. The statues faced not outward, not to the sea, but inward, toward the now empty, denuded landscape. 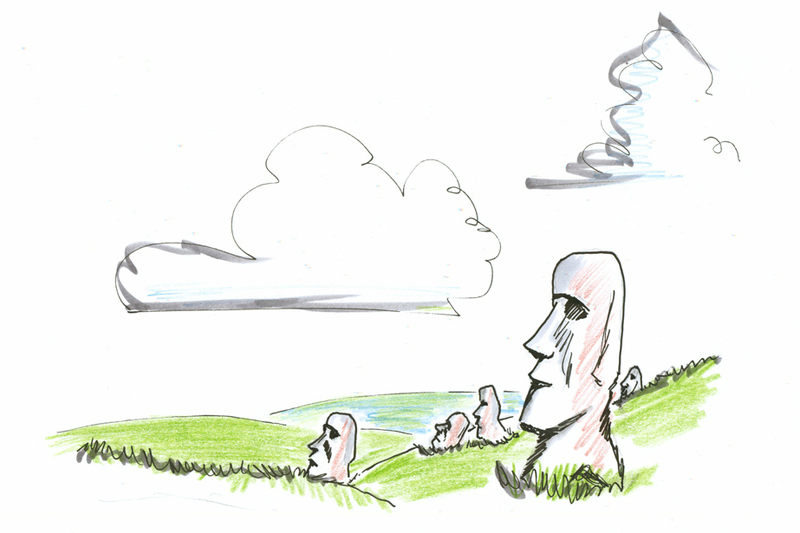 When Captain Cook saw them, many of these "moai" had been toppled and lay face down, in abject defeat. OK, that's the story we all know, the Collapse story. The new one is very different. It comes from two anthropologists, Terry Hunt and Carl Lipo, from the University of Hawaii. They say, "Rather than a case of abject failure," what happened to the people on Easter Island "is an unlikely story of success." Success? How could anyone call what happened on Easter Island a "success?" Well, I've taken a look at their book, The Statues That Walked, and oddly enough they've got a case, although I'll say in advance what they call "success" strikes me as just as scary — maybe scarier. Here's their argument: Professors Hunt and Lipo say fossil hunters and paleobotanists have found no hard evidence that the first Polynesian settlers set fire to the forest to clear land — what's called "large scale prehistoric farming." The trees did die, no question. But instead of fire, Hunt and Lipo blame rats. In laboratory settings, Polynesian rat populations can double in 47 days. Throw a breeding pair into an island with no predators and abundant food and arithmetic suggests the result ... If the animals multiplied as they did in Hawaii, the authors calculate, [Easter Island] would quickly have housed between two and three million. Among the favorite food sources of R. exulans are tree seeds and tree sprouts. 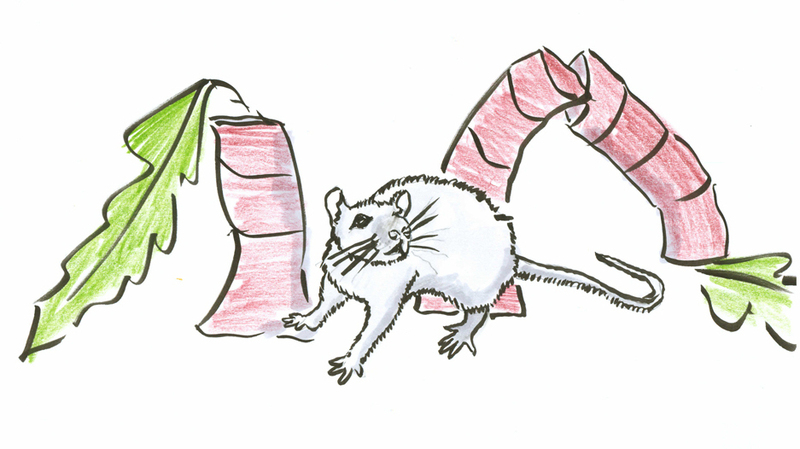 Humans surely cleared some of the forest, but the real damage would have come from the rats that prevented new growth. As the trees went, so did 20 other forest plants, six land birds and several sea birds. So there was definitely less choice in food, a much narrower diet, and yet people continued to live on Easter Island, and food, it seems, was not their big problem. 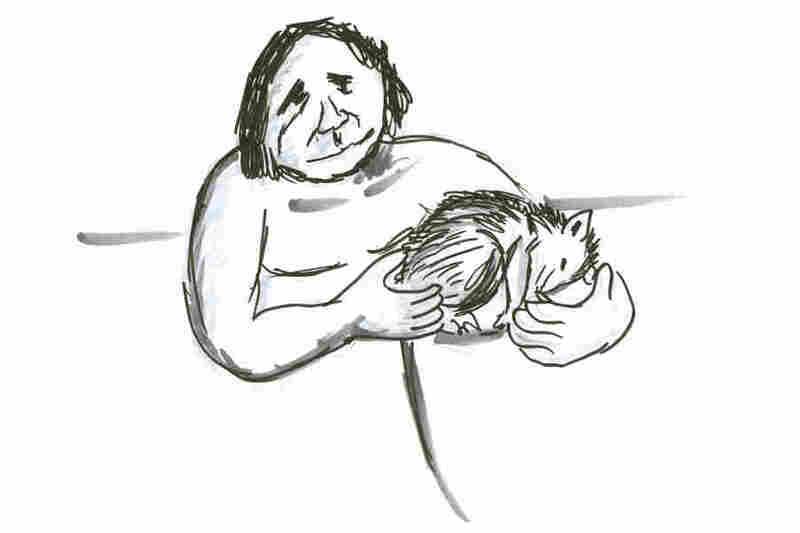 For one thing, they could eat rats. As J.B. MacKinnon reports in his new book, The Once and Future World, archeologists examined ancient garbage heaps on Easter Island looking for discarded bones and found "that 60 percent of the bones came from introduced rats." So they'd found a meat substitute. 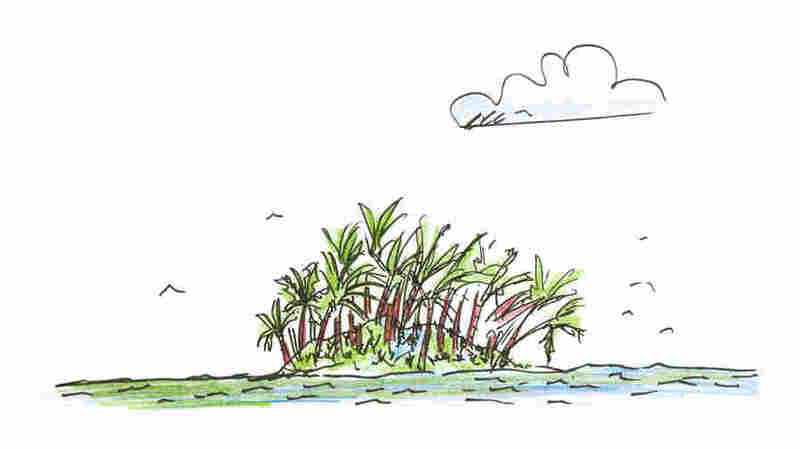 What's more, though the island hadn't much water and its soil wasn't rich, the islanders took stones, broke them into bits, and scattered them onto open fields creating an uneven surface. When wind blew in off the sea, the bumpy rocks produced more turbulent airflow, "releasing mineral nutrients in the rock," J.B. MacKinnon says, which gave the soil just enough of a nutrient boost to support basic vegetables. One tenth of the island had these scattered rock "gardens," and they produced enough food, "to sustain a population density similar to places like Oklahoma, Colorado, Sweden and New Zealand today." According to MacKinnon, scientists say that Easter Island skeletons from that time show "less malnutrition than people in Europe." When a Dutch explorer, Jacob Roggevin, happened by in 1722, he wrote that islanders didn't ask for food. They wanted European hats instead. And, of course, starving folks typically don't have the time or energy to carve and shove 70-ton statues around their island. Why is this a success story? Because, say the Hawaiian anthropologists, clans and families on Easter Island didn't fall apart. It's true, the island became desolate, emptier. The ecosystem was severely compromised. And yet, say the anthropologists, Easter Islanders didn't disappear. They adjusted. They had no lumber to build canoes to go deep-sea fishing. They had fewer birds to hunt. They didn't have coconuts. But they kept going on rat meat and small helpings of vegetables. They made do. One niggling question: If everybody was eating enough, why did the population decline? Probably, the professors say, from sexually transmitted diseases after Europeans came visiting. OK, maybe there was no "ecocide." But is this good news? Should we celebrate? I wonder. What we have here are two scenarios ostensibly about Easter Island's past, but really about what might be our planet's future. The first scenario — an ecological collapse — nobody wants that. But let's think about this new alternative — where humans degrade their environment but somehow "muddle through." Is that better? In some ways, I think this "success" story is just as scary. What if the planet's ecosystem, as J.B. MacKinnon puts it, "is reduced to a ruin, yet its people endure, worshipping their gods and coveting status objects while surviving on some futuristic equivalent of the Easter Islanders' rat meat and rock gardens?" Humans are a very adaptable species. We've seen people grow used to slums, adjust to concentration camps, learn to live with what fate hands them. If our future is to continuously degrade our planet, lose plant after plant, animal after animal, forgetting what we once enjoyed, adjusting to lesser circumstances, never shouting, "That's It!" — always making do, I wouldn't call that "success." People can't remember what their great-grandparents saw, ate and loved about the world. They only know what they know. To prevent an ecological crisis, we must become alarmed. That's when we'll act. The new Easter Island story suggests that humans may never hit the alarm. It's like the story people used to tell about Tang, a sad, flat synthetic orange juice popularized by NASA. If you know what real orange juice tastes like, Tang is no achievement. But if you are on a 50-year voyage, if you lose the memory of real orange juice, then gradually, you begin to think Tang is delicious. On Easter Island, people learned to live with less and forgot what it was like to have more. Maybe that will happen to us. There's a lesson here. It's not a happy one. As MacKinnon puts it: "If you're waiting for an ecological crisis to persuade human beings to change their troubled relationship with nature — you could be waiting a long, long time."